So this weekend was my first Mother’s Day and I had a lovely weekend. Allen’s mom and her husband came to visit us which was a nice treat. They had not seen Nathaniel since Christmas and needless to say he has changed greatly since that time. They really had a great time with him. On Saturday, they babysat while Allen and I went to the Melting Pot for dinner (Yum!!). 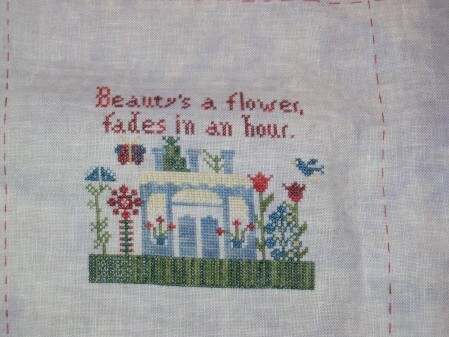 My MIL just love spending as much time as she could with Nathaniel, so I had a ton of time to stitch. That was my main Mother’s Day gift:) Allen and I are also planning to buy ourselves a small video camera as our first Mother’s/Father’s Day gift. After I finished Deb’s House, I pulled out Nathaniel’s birth sampler. I haven’t worked on it in a while, but would like to finish it soon. I am about halfway finished at this point and really like how it is turning out. I think I am going to try and get at least one more band finished before moving on to something else and will probably rework my “rotation” and make this my focus piece for a while. 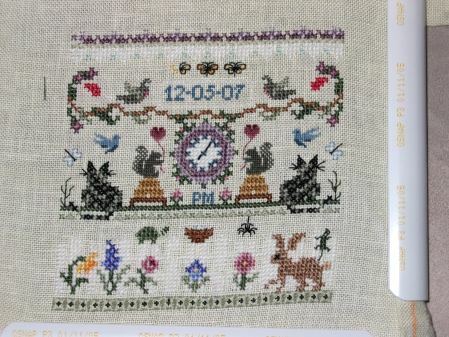 I love your addition to Deb’s RR and I cannot tell you how much I love that birthsampler! Happy Belated Mother’s Day! Too funny, Allen sounds just like Rob. I’m glad you enjoyed your first Mother’s Day. sounds like a great Mothers Day. Tell your DH that I love video games and am in my 40s. No harm in that lol. I am glad that you had a fabulous Mother’s Day. Your wips are looking great and I love the photos of you and your family.